AC Transit's largest service expansion in years, dubbed AC Go, has launched on June 26, and brings an unprecedented 14% expansion in AC Transit service to East Bay riders. Line 12: The line has been extended from its current terminal, at 10th & Washington Streets in Downtown Oakland, to Oakland Amtrak. Line 57: The line has been extended via 40th & Shellmound Streets to the Emeryville Public Market, past its previous terminal at 40th Street and San Pablo Ave.
Line 99: The 99 has been extended to San Leandro BART. It will continue to serve Bay Fair BART. Line 1: The International bus now runs from 12th Street BART to San Leandro BART every 8 minutes. Line 7: Frequency has been increased from every 40 to every 30 minutes. Line 52: Frequency has been increased to every 15 minutes during peak hours, and every 20 minutes off-peak. Line 62: Frequency has been increased to every 15 minutes during peak hours, and every 20 minutes off-peak. Line 88: Frequency has been increased to every 15 minutes. Line 98: The redesigned line now runs between Coliseum BART and Eastmont Transit Center via 98th Ave. The 98 will run every 20 minutes. The service day has also been increased from 9:45 PM to 11:00 PM. Line 6: The new 6 is meant to replace Line 1 service from Downtown Berkeley to Downtown Oakland, and operates from Berkeley BART to 10th & Washington Streets (12th Street BART) every 10 minutes. Line 90: This new East Oakland line runs from Coliseum BART to Foothill Square via 85th & 90th Avenues every 20 minutes. Line 1R: Yes, the 1R: International Rapid is gone, soon to be replaced by AC Transit's Bus Rapid Transit Line, the first in the East Bay. Construction of the BRT line has prompted the cancellation of the 1R, but the newly added Line 6 is here to combat that cancellation for regular 1R riders. Line 58L: The 58L, between Oakland Amtrak and Eastmont Mall via MacArthur Blvd, is gone as well, and its recourses have been shifted to improving the updated Line 57 and the NL with greater service. Between the fiscal years of 2013-2014 and today, AC Transit has placed 210 new buses onto our city streets, with 96 more to come this fiscal year alone. These modern buses are slowly replacing AC Transit's old fleet of just over 600 buses. Many of AC Transit's older vehicles have well exceeded their life expectancy, and need to be replaced sooner rather than later. With AC Go, 25 new 40 foot Diesel Electric Hybrid buses will be rolled out for revenue service between June and August. These are made locally by Gillig in Hayward, and are designed to reduce carbon emissions drastically. In late 2017 or early 2018, 10 New Flyer Fuel Cell Buses and 5 New Flyer Battery Electric buses, both of which burn zero emissions, will be added to AC Transit's fleet. Also coming in 2017 and 2018 are the introduction of 29 60-foot articulated buses, 10 double-decker buses for transbay service, and 10-foot buses. If you need an example of a terrific transit agency that has no problem getting stuff done, then look no further than AC Transit. 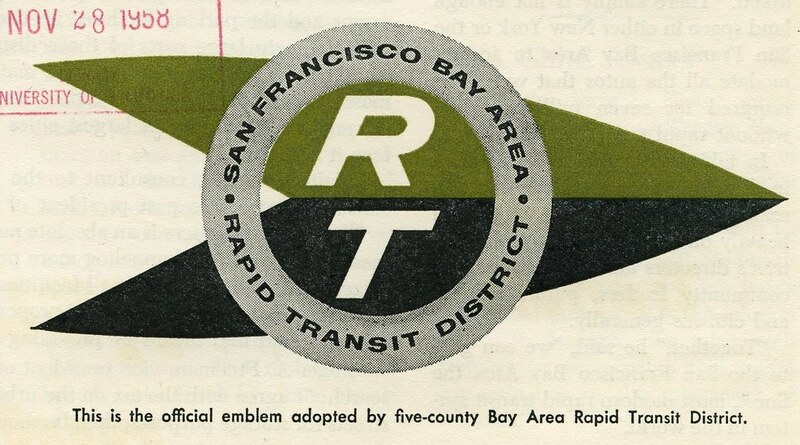 No agency is perfect by any means, but we believe AC Transit can serve as a role model to other agencies around the Bay Area and to agencies throughout the United States. For more information on AC Go, visit actransit.org. 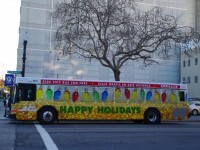 If you happen to spot a bus with bright green font reading "HAPPY HOLIDAYS" in giant letters, than that bus is free! Once again, AC Transit has rolled out their annual holiday bus, with free rides to anyone who boards, if you're lucky enough to nab it. AC Transit is also collecting food for the Alameda County Food Bank at 1600 Franklin Street in Oakland. The most wanted items are canned meats and fish, pasta and sauces, low-salt soups, stews and chili, beans and rice, peanut butter, low-sugar cereal and oatmeal. Food encased in glass is not accepted. You can find more information at www.actransit.org. The 29th Avenue overpass has been closed for construction for ten months, meaning AC Transit lines 20 & 21 must detour around the site. To Downtown Oakland (20) & Oakland International Airport (21), both lines will not serve stops between Fruitvale BART and on Park Street at Clement Avenue in Alameda. To the Dimond District, both lines won't serve stops between Park Street at Buena Vista in Alameda and at Fruitvale BART. For more info, visit www.actransit.org. Changes are coming to over two dozen AC Transit lines December 20th, with many changes to both local and transbay lines. For details on service changes to local/East Bay lines, click on http://www.actransit.org/2015/12/11/54667/. For details on service changes to Transbay/SF lines, click on http://www.actransit.org/2015/12/11/service-changes-on-ac-transit-transbay-lines-effective-sunday-december-20/. 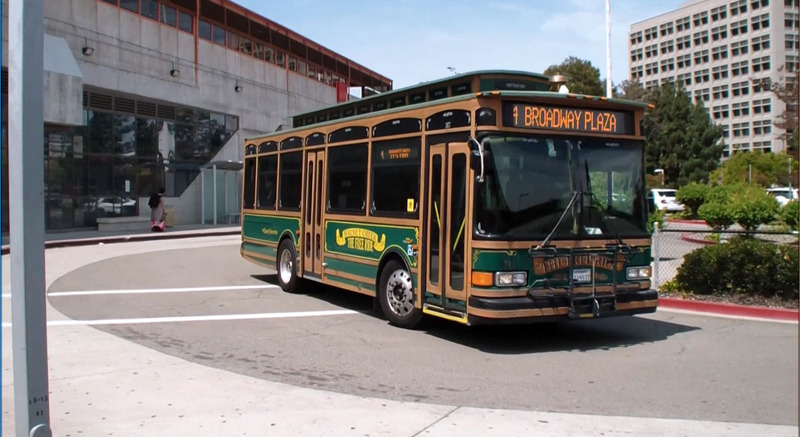 A dozen AC Transit lines wil be affected during the Berkeley Half Marathon November 22nd. For a list of all the lines affected during the Marathon, click here. Due to high ridership, AC Transit has increased the frequency of Line 217. To view the new schedule, click here. For more details, go to www.actransit.org. The AC Transit Board of Directors has made the decision to continue Line 46L, a one-year pilot line which restored service to Grass Valley. The pilot ends in December, and the 46L will become permanent. The decision was also made to eliminate Line 822 which, despite large amounts of advertising, suffered under low ridership. The line ran from 24th Street BART to Pittsburg BART. The Board also approved Option 4 for lines 800 and 801. A one-year pilot, the 800 was extended to 16th Street & 24th Street BART Stations and increased frequency to every 20 minutes on weekends. This will become permanent. Line 801 between Downtown Oakland and Bay Fair BART will also run every 20 minutes on weekends. 75% of these service improvements will be funded by BART. Visit www.actransit.org for more details. During BART's Transbay Closure Labor Day Weekend September 5th, 6th and 7th, AC Transit will modify its Transbay Bus Service. Southbound bus stops on Broadway at Thomas L. Berkley Way (20th Street) in Downtown Oakland will be moved to accommodate BART's Lifeline Bus Service. For more info, click here. AC Transbay Buses F and O will reroute to take advantage of bus-only access to the Bay Bridge via West Grand Avenue during the Transbay Closure. The Lifeline Bus Service will not affect AC Transit's normal bus lines in the Uptown Transit Center, and no schedules will be affected. We encourage you to try to avoid transbay travel as much as possible, as each alternative - buses, cars, ferries, will be noticeably more crowded than normal weekends. The AC Transit Board of Directors will be holding a public hearing September 9th to discuss proposed changes, extensions, and eliminations of Lines 46L, 800, 801, and 822. The Board will consider the continuation of Line 46L next year, which is a one-year pilot beginning in December of 2014. 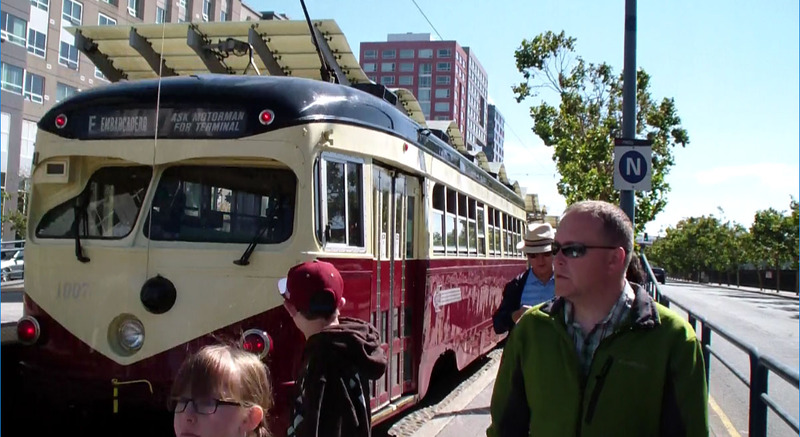 The line parallels Route 46, traveling from Coliseum BART to the Oakland Zoo with limited stops, and continues along Golf Links Road to Dunkirk Avenue in Grass Valley. The Board will discuss the possibility of making weekend service on the 800 between the 16th Street & 24th Street BART Stations, with buses every 15, 20 or 30 minutes apart, permanent. 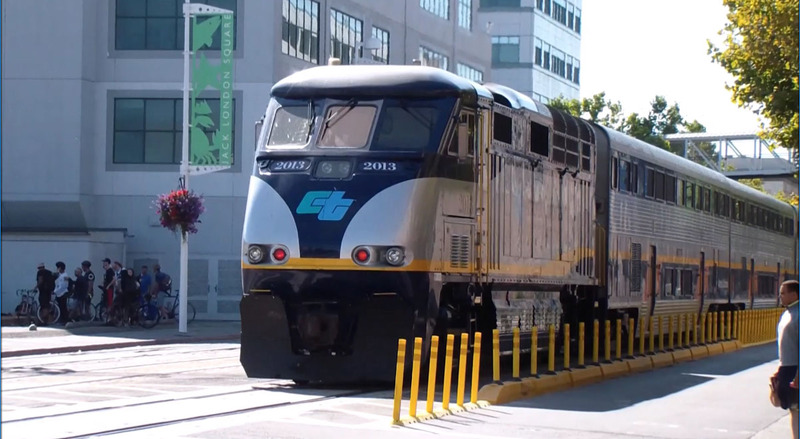 The Downtown Oakland - Richmond section will continue to operate every 30 minutes. The Board is considering permanent weekend service to Line 801 as well. From Downtown Oakland to Bay Fair BART will operate at 20 or 30-minute frequency, and from Bay Fair BART to Fremont BART will operate every 60 minutes. 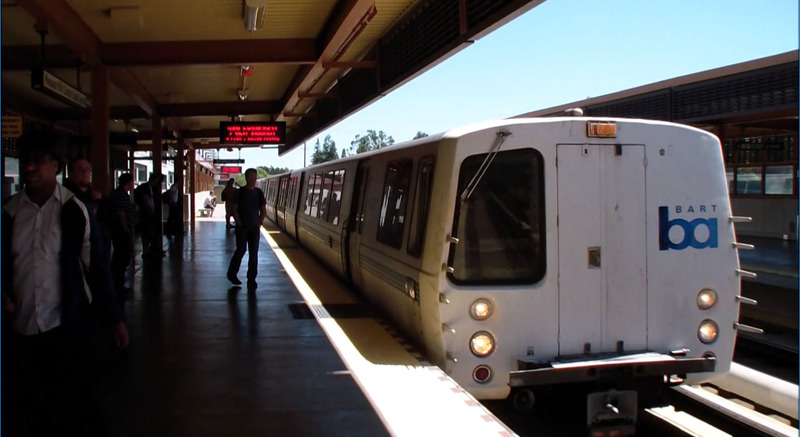 The line is designed to serve weekend riders after the BART System closes for the night. However, despite substantial amounts of advertising and publicity, the line suffers from very low ridership, leading to the recommendation of elimination of Line 822. For more details, visit www.actransit.org.